A friend recently encouraged me to share more of what I wear and why I've chosen those pieces. I always hesitate because I don't have a perfectly minimal or ethical wardrobe. 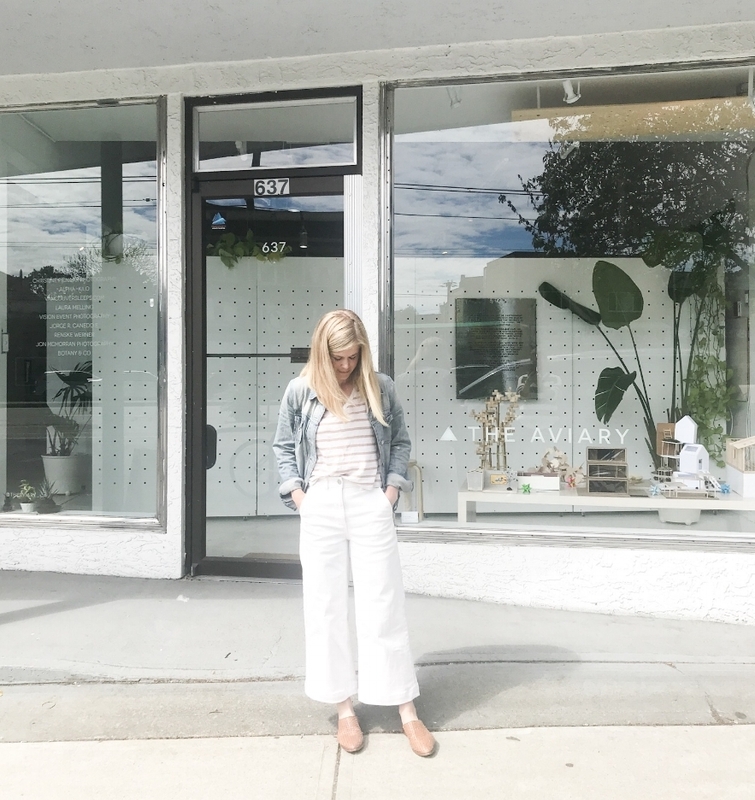 But I am trying slowly but surely to minimize my wardrobe and select sustainable and ethical clothing for myself and my kids. This means shopping second hand, borrowing/exchanging with friends or saving up to buy key pieces from conscious brands. I still slip up. But our life and this blog is not about being perfect or living up to some impossible standard. I bought this skirt in the spring. Knowing that I didn't have any midi or maxi skirts in my closet. I considered the tops and blouses I had already in my closet and knew that chambray would go with most. I was able to think of 4 outfits with existing tops and knew that it would create a unique silhouette than other go-to outfits of mine. I decided the skirt was worth the investment and now I have lost track of how many wears I have gotten out of it this spring and summer. I find it best suits slightly cropped T's and tanks. It's perfect for staying cool but still looking professional enough for my days in the office. So while it may not meet the highest of ethical standards, it does meet standards of quality and exceeded my expectations on cost per wears. Cost Per Wears: Do you use this tool when deciding what to buy next? There is nothing worse to me than buying a new clothing item to find it sits in my closet only to be worn a few times. I can justify paying a higher price for clothing items if I am sure to get a large number of wears from it. Say a sweater is $200 but you wear it 75 times over a season, that's $2.60 per wear. If that sweater lasts for multiple seasons the cost per wears drops even lower and definitely feels worth the investment. I've had this jacket for 7 years now and wear it every spring, summer. and fall I can't remember what I paid but I'm so happy I chose the lighter wash and vintage fit so it doesn't seem to go out of style. I got these in the spring and have lost count of the amount of wears. I've worn them about 5 times a week since I got them. They are the perfect shoe to dress up jeans or make a dress more casual. They are completing every outfit and holding up well with all the walking I do everyday. Unfortunately they are sold out but these are similar. This top was an investment in an ethical brand. It took me weeks to make the decision but I'm really happy with it. It's raw silk, a fabric I have been reading is so wonderful and I have to say I agree. It is washing well and is very comfortable. It may be quite cropped on someone taller but on 5'2" me it's just the right length. I wore it for the Cup of Jo photoshoot and an important meeting the other day, as well as running around with the kids. Trevor and I have made a pact to minimize our wardrobes even further to clear out one side of our master closet for household/kid storage rather than our clothes. When I look at my wardrobe the items that are taking up space but not being worn are my silk dresses and blazers that I used to wear weekly to my business casual office but no longer wear in my freelance work. I keep thinking there is going to be a cocktail party or important meeting that I will need to wear these to but it's been a year and I haven't worn them. Furthermore, I remember how much these dresses and blazers cost and it makes donating them difficult. But as I find the words to write this I realize I need to make space in my closet and mind for this new career change and let go of my old career which means letting go of these clothes. They are no longer useful to me and aren't bringing me joy. I am holding myself accountable (right now) to find the right place to donate my old business clothes!